As a filler between Mythic Legions Series 1 and 2, the Four Horsemen offered Mythic Legions: Coliseum, a set of eight new characters drawn from Mythoss' gladiator pits. With a few somewhat familar faces, too. A perennial champion of the Mercurian Coliseum, Adamonn often relied on his nearly unnatural strength to conquer his foes. With a winning streak only second to the legendary Calavius, his brutal and effective style of combat made him a favorite of the Mercurian people. After taking part in the gladiatorial rebellion that ended the games forever, Adamonn went to join Attlus and his noble clan of outcast warriors. Oh, Four Horsemen, you cheeky little scamps! First, in Mythic Legions Series 1.5, they released Unkann the orc, whose green skin and bright yellow armor looked rather familiar. Now, in Coliseum, we get Adamonn the barbarian. We see what you're doing, Horsemen, and we approve! Everybody loves a wink and a nod to old favorites! 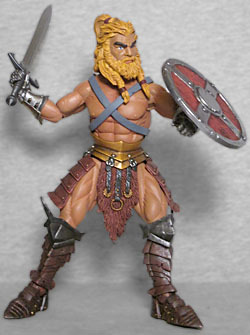 This is, quite clearly, a Mythic Legions version of He-Man. He's built entirely from the existing parts library, but the parallels are strong. He's got the bare chest and arms, then the "heroic" gauntlets. He's wearing skirt armor, because that's a requirement of the Mythic Legions construction style - in this case, the rounded tassets and high fauld - but it's paired with the furry loincloth piece to maintain some MotU continuity. He wears the sharp, "villainous" boots, but with the small pointed toes. 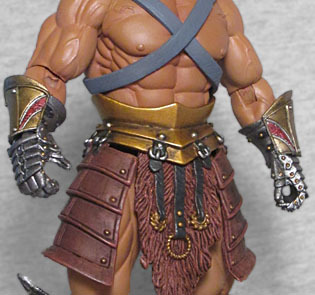 Mythic Legions doesn't have a chest harness of the sort He-Man wears, but the toy fakes it by crossing two of the weapon-straps across his torso. Neat! Adamonn doesn't have the soft, friendly face you might expect from a real He-Man - instead, he reuses Attlus' head, the one with the thick beard, ponytail, and twin braids falling over the shoulders. That's a pretty massive departure, but it does make him look appropriately barbarous - and other than the beard, it looks a lot like the Horsemen's original idea for the 2002 He-Man. The colors are what really sell this homage. The hair is a dirty yellow - not blonde, yellow - and his skin is as orange as Hulk Hogan's. the chest straps are flat grey. His gauntlets are silver, with red and gold accents on the back, while his boots are brown with gunmetal grey kneepads. The golden belt is contrasted against the reddish brown of his skirt. Painted in different colors, nothing about this assemblage of pieces would scream "He-Man," but the Horsemen knew just how to put him together to get the idea across. And of course, since all the pieces are reused, the articulation is right up there with all the rest of the figures. Even the accessories are calculated to strengthen the ties. 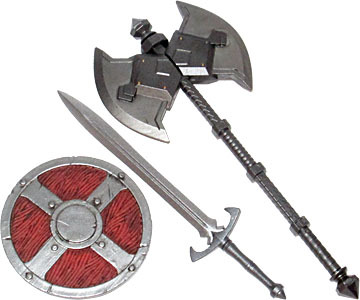 He has that same sword all the Mythic Legions came with, and that same modular axe, but the shield is one of the ones that was previously only available in a Weapons Pack: a wooden shield with a metal frame, just the sort of design He-Man always carried. They could have given him one of the unique swords, to better match the Power Sword, but remember: this isn't meant to be He-Man, the Most Powerful Man in the Universe, it's Adamonn, Guy Who Happens to Look Like He-Man; he shouldn't have a special sword, he should have a normal one. And he does. Plus a shield and a massive axe. There's also a battle helmet with a golden eagle on top - like he stole one of the Order of Eathyron's helmets and had it repainted to fit his own personal style. The helmet itself if gret, with a rusty-colored cross over the face. This really doesn't mesh with the "He-Man" feeling of the figure (at least, not without giving him a different chest and pretending it's his battle armor), but the figure still looks good wearing it. But here's a question for you: should the eagle crest have been painted in Zoar's colors rather than solid gold? 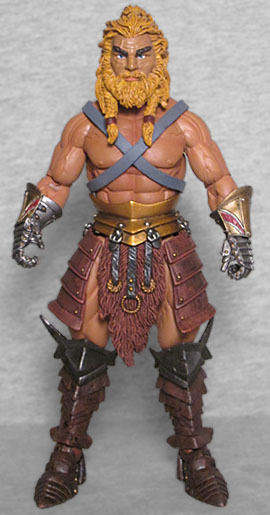 Unfortunately, I passed on Unkann when he was made, not realizing there'd be a whole sub-set of MotU-themed Mythic Legions figures. I wasn't about to make that same mistake with Adamonn! You've got to admire the creativity that went into homaging one of the properties so closely associated with the Four Horsemen - but now, how about a character wearing black and red armor with a gigantic cape?